I love to do this kind of piece on reporting the facts. I pick a travel plan of my own and compare all the big companies and show you the differences at the time of writing. Many people may not realize the differences that are out there. Even using a site that searches a bunch of travel website may all show the same rounded number, in this case $110. In reality, after the inconsistent taxes and fees that various websites impose, the range of rates is $4. This is where they hide some of their commission and profit margin on the booking. So here is the breakdown and things to note. Going direct is your best overall deal when you look at price and cancellation policy. Priceline is the cheapest by a dollar and they have no cancellation fee but notice that you have to cancel a whole 3 days early. Expedia, Orbitz and Travelocity all have the $25 change/cancel policy. This is a pure profit charge for them for no matter when you change your plans. This is for the Hilton Garden Inn at the Albuquerque airport for a one night stay in the month of February. Hilton Official Website: $125.24 No cancels fee up to 6pm on day of arrival. Expedia.com: $128.78 $25 cancel fee is mentioned up front. Hotels.com: $126.58 You have enter your information before finding that there is no cancel fee until 6pm local time on day of arrival. Orbitz.com: $128.51 $25 cancel fee before 12am local time (essentially the night before you arrive) on the day of your arrival. Full charge if canceled on day of arrival. Priceline.com: $124.41 It is mentioned up front that there is no fee if canceled three days before arrival. Whole night's rate for fee if canceled on day of arrival. Travelocity.com: $127.50 $25 cancel fee before 12am local time (essentially the night before you arrive) on the day of your arrival. Full charge if canceled on day of arrival. AllStays.com: We link to the hotel direct on our city page, so you can always go directly to the hotel website and get their rate information and book online or call them on the phone. 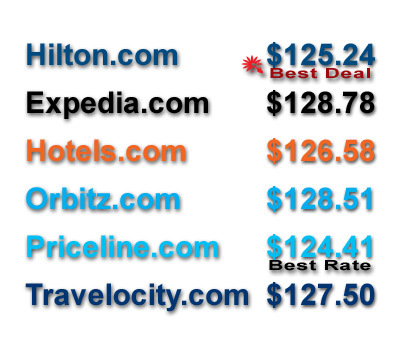 In our online search box, we partner with Travelocity.com so we have the same rate as they do. They also impose their same $25 cancellation fee that we despise and get zero of it. So we may not make any money off from linking to Hilton Garden Inns directly or providing the phone number, but it is simply the safest and best deal to have your reservation at the front desk. As a traveler, it's the thing to do. It's not costing you more than the self called bargain websites and the cancel policy is much more friendly as well. What do you think and does this kind of information change the way you think about booking travel?